We are proud to announce that this year we are working in association with Bath Christmas Market and have secured two dates in Queen Square over the first two weekends of the main market. Bath Christmas Market are supporting us with marketing on their website and including us as a "fringe event" to the main market to help ease congestion near the Abbey and also to give local traders a chance to trade in front of the thousands of visitors who flood into the city at this time. The dates are Sunday November 26th and Saturday 2nd December 2017 on which days we will be trading during the same hours as traders in the main market ie 11am to 7pm. 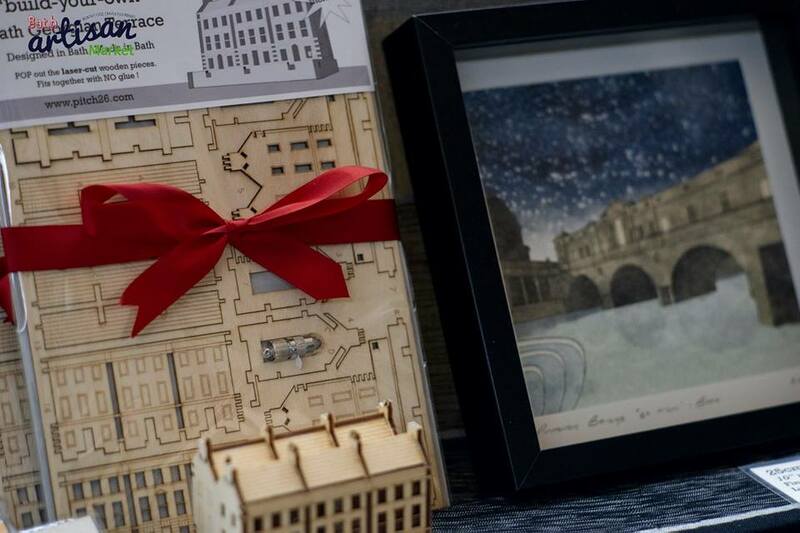 It is a fantastic chance to be part of the Bath Christmas Market so we hope you will join us! 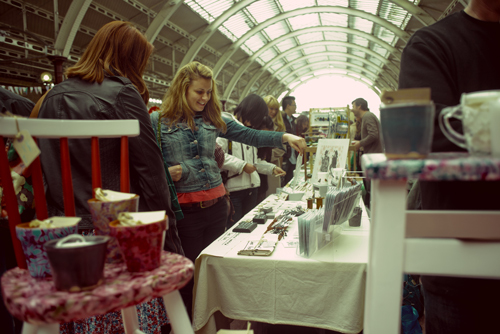 We also still have some availability for traders at our Gift Fair on November 19th at Queen Square (10am-4pm) and our Christmas Markets at Green Park Station on December 10th and 17th 2017. Pitches still available are listed on this form and anyone booking and paying for 3 dates or more will receive a 10% discount. We do need forms to cope with the amount of admin and enquiries we receive but sometimes people have trouble with them. If you have a problem you should have an automatically saved copy you can refer to. Then check the attachment boxes - unhelpfully these are not highlighted when you forget something. If your pics/scans are too large please send low-res versions. Google "How to Resize a Photo" if you have problems or try this app. 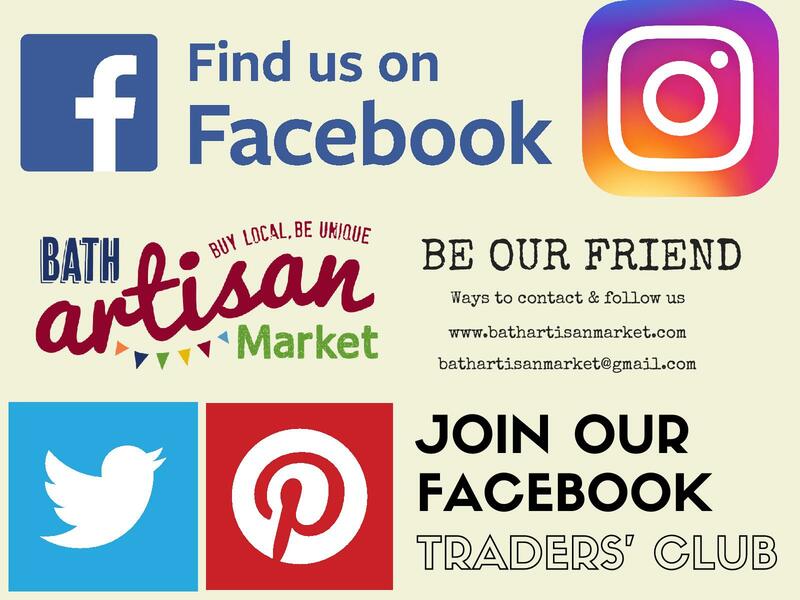 Alternatively attach any small image, logo or photo and email the images separately to bathartisanmarket@gmail.com. The form is not very compatible with iPads so try another computer if you are having trouble and are using one. We are planning limited lighting in the square - light projections and uplighting but please bring your own LED battery operated lighting too. We will be lighting the square using the electric supply in the park which is limited, so traders are asked to bring their own power (non-electric). Those trading under our covers (covered artisan or food), however, will have lights provided by us but there will be no electricity points for your own personal use. There will be 3m x 3m pitches on the back left-hand square, facing the paths all around. Those stalls facing the back or side of the square (away from main entrance) are priced slightly cheaper, but customers will have the advantage of being able to walk around the paths in front of stalls. There will be a tent on the right hand square that will have live music and tables and chairs inside and is ideal for food/drink producers. The sides will be down if the weather is bad but up if it is good. 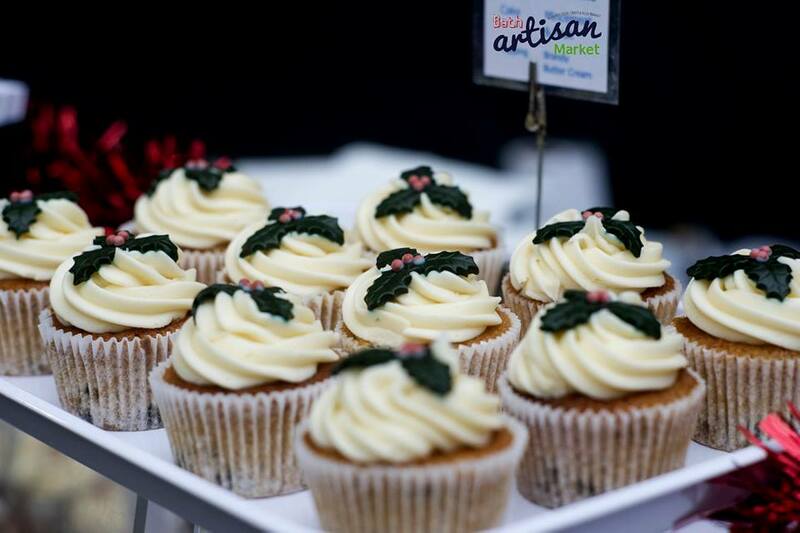 How did you hear about Bath Artisan Market? Please read the following sections and make sure you read the terms and conditions at the end. If you agree, press submit at the bottom of this form and wait to hear from us. We will either send you an invoice or an email discussing your requirements, followed by an invoice. When you receive your invoice, please make payment by the payment due date. If we don't receive payment we will send you a reminder letter but reserve the right to cancel your stall if we don't hear from you and payment is not made. Payment details will appear on the invoice. Please note your pitch is not confirmed until it is paid for. We will include any admin fees agreed. Please do not send any money for pitches without receiving an invoice. We accept cash on market days for future dates only. You must pay before the event to secure your pitch. Cancellations of 7 days or fewer - no refund by a transfer date may be offered. Only one transfer may be used. TRANSFERS - where traders ask to transfer dates, a £5 admin fee will be charged if less than 30 days notice is given. CHANGES TO TRADING RIGHTS Trader status may be withdrawn immediately from any Trader at the discretion of the Market Manager if the Trader breaches any of the terms and conditions. The Market Manager may withdraw Trader status on one week’s written notice. EVENT CANCELLATION The event organiser reserves the right to cancel the event within 24hrs notice due to unforeseen circumstances such as acts of god or bad weather. No refunds issued in such cases. BAD WEATHER Due to the nature of the old building at Green Park Station, in extreme weather conditions the wind can drive the rain through the steam vents in the roof on to the main square. Traders must be prepared to protect their own stock and no refunds can be given due to bad weather. RESERVED REGULAR PITCHES Traders who commit to trading each month can ask for a regular pitch through the year, arranged in advance, with one month's break regarded as holiday. A Trader who is absent for two consecutive months without notification will lose rights to their reserved stall & will be required to reapply. NON PAYMENT Stalls are not held without payment unless agreed in advance in writing. NON ATTENDANCE No refunds can are given for non attendance on the day. TRANSFERS - Traders may transfer dates, but a £5 admin fee will be charged if a transfer is requested less than 30 days before the market date. Please notify the market by texting 07769 707636 on the day of the market if you cannot attend. SICKNESS In the event of non attendance due to sickness, the traders fee/refund will be at the discretion of the Market Manager, especially if notifed in advance. REFUNDS FOR SICKNESS are only issued for cancellation through sickness on the day of trading in exceptional circumstances. HEALTH & SAFETY Traders are responsible for ensuring the safety of all stall premises and equipment brought onto the site; also for proper use of stalls and equipment provided by Green Park Station Market, and for reporting promptly any faults or damage to the latter. They must ensure that equipment used meets Health & Safety requirements. Traders must not cause or permit any obstruction to walkways (which must be maintained to a width of not less than 2.5 metres), entrances or fire exits. Use of heaters on the market is strictly forbidden. Traders must comply with Consumer Legislation and any other relevant enactment. 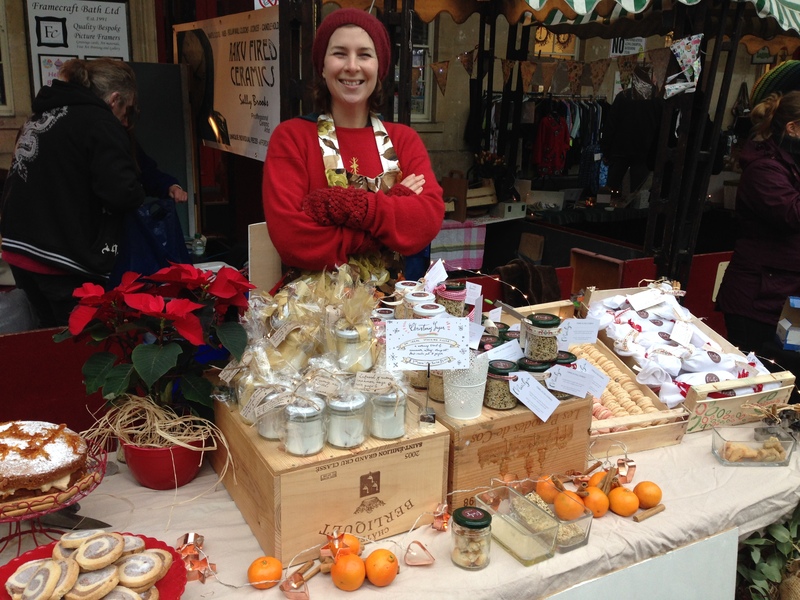 Bath Artisan Market reserves the right to share trader contact address information in the case of a product complaint. INSURANCE A trader must hold public and product liability insurance to a value not less than £5,000,000. Evidence of cover must be presented with the application to trade and thereafter at each renewal of the policy. ELECTRICAL SUPPLY Traders must not misuse any electricity supply which is provided for lighting and approved equipment only. Applications to use any electricity supply for equipment other than lighting must be made in writing to the Market Manager and such equipment must not be used until a formal decision is received. This will require the equipment to have undergone amarket PAT test, or production of a valid PAT certificate. GOODS All Goods approved for sale at the market are at the full discretion of the Market Management team. We welcome applications from all traders. We may reject applications to trade specific items, or refuse trading based on the consideration of the impact of each stall on the Bath Artisan Market as a whole. Queries on any decisions should be made in writing. All goods to be offered for sale must be listed on the application form. Any application to vary the list of authorised goods must be made in writing to the Market Manager. The proposed new goods should not be displayed unless written approval has been received from the Market Manager. If a Trader fails to regularly display any item(s) listed on the application form (or any subsequent approved amendment) the Market Manager may withdraw consent for trading that particular item by giving written notice to the Trader. STALL PRESENTATION & USE Traders must keep their stall(s)/pitch(es) tidy at all times, with all empty boxes and containers stored out of sight. At the close of each day’s trading, traders must clean the stall(s)/pitch(es) area and the stall must be returned to its original configuration. Stall(s)/pitch(es) must be clear by 4.45pm. Any rubbish produced during the event must be taken off site – there are no facilities for the disposal of rubbish on site. Traders must not allow their refuse to litter the markets. Goods must not be hung or placed at the front of a stall so as to project beyond the frontage of any fixed stallboard. Additional display areas may only be utilised at the discretion of the Market Manager. Traders occupying ‘pitching’ space must not encroach beyond the limits of those pitches. In instances where the rear of stalls face into public aisles goods may only be placed at the discretion of the officer in charge up to a maximum of 4 ft. from the rear of the stall counter. If such space is used for selling or displaying rather than storage of goods the appropriate charge will be made. Stall(s)/pitch(es) are to be used for quiet selling. Where traders wish to use trading positions for demonstrating, pitching, or other means of attracting a crowd, then approval – in writing – must be gained from the Market Manager. For outside events where stallholders are bringing their own gazebos or display, stallholders must stake and weight their stalls using a minimum 2 x 13kg weights per leg (or equivalent thereof) and staking into the ground where necessary. If a member of the BAM team deems the stall unsafe it will be taken down and traders still able to trade but not under the gazebo/stall, unless it can be made safe on the day. TENTED STALL TRADERS AT GREEN PARK must not deface or alter any stall structure in any way. Traders must leave the stall in its standard layout (with stallboards being attached to the lowest supports, and any spare wood stored behind the back board), Please speak to the Market Manager if you are unclear on this. MARKET LAYOUT Location of traders within the market is at the discretion of the Market Manager. Traders who wish to change their stall(s)/pitch(es) position must refer to the Market Manager. TRADING HOURS Traders must occupy their stall(s)/pitch(es) by 9.00 am unless otherwise notified and, except in the event of an emergency only, where notice is given to the markets officer prior to 7.45 am any unoccupied stall(s)/pitch(es) will be let to any person(s) waiting for space after 8.30 am. Traders must keep their stall(s)/ pitch(es) stocked throughout the trading day and must not vacate the stall(s)/ pitch(es) before 3.45 pm except at the discretion of the Market Manager. UNLOADING AND SETTING UP Traders must take care during unloading and setting up, and when packing away, not to cause an obstruction or hazard; nor should they generate any excessive or unnecessary noise. Barrows, boxes and vehicles must be expeditiously loaded or unloaded and once emptied removed from the gangways and pedestrianised areas of the market. Any trader seen to be delaying the loading/unloading process by setting out a stall or wasting time will be deemed to be acting in contravention of the regulations. NOISE Live or recorded music is only permitted at the discretion of the Market Manager. The permitted sound level of any live or recorded music will be at their discretion. CHILDREN Children under the age of 14 years are not permitted to remain at the stall during market trading hours. ANIMALS No trader shall keep any dog or other animal at their stall(s)/ pitch(es) unless at the discretion of the Market Manager. BEHAVIOUR Traders and/or their employees must conduct themselves in an orderly manner and must not use obscene language. Abusive or anti-social behaviour whilst on site, by Traders or by anyone associated with that person, will result in instant dismissal from the market. Abusive behaviour, either verbal or written, towards Bath Artisan staff, will not be tolerated and will result in instant dismissal from the market. Goods of an offensive or obscene nature (as determined by the Market Manager) must not be displayed. Green Park: As the site has 3 walls and a roof, under government regulations it is considered a Smoke Free Zone. It is therefore our policy that there will be no smoking at any of the stalls in the station. Any trader found smoking at their stall will be dismissed from the market. Anyone who does not comply with the Smokefree regulations (i.e smokes within a Smokefree area) is committing a criminal offence. This means that if you are found to be smoking on any part of the Station or car park, you could also be fined a fixed penalty notice of £50 for each breach by the Council. If you wish to smoke you must go out of the site either via the foyer, by the Sainsbury’s cashpoints, once you have left the area covered by the roof or right into the Sainsbury’s car park. Smoking will not be tolerated on site. REGULAR PITCHES Traders who attend regularly are permitted to ask for a regular pitch. However, a trader is expected to trade at 10 out of 12 events (allowing two month’s break) to retain the same pitch. Any trader not attending this regularly will not automatically receive the same pitch. DISPUTES In the event of a dispute the Market Manager’s decision is final. Now that you have finished, please press submit. However, if there are errors on the form you will need to go back and check each page. Please look for all questions with an * as some of them may not be highlighted even if you have missed them. Also any photos or scans might be too large so you can either delete them and send separately to bathartisanmarket@gmail.com or try resizing them so that they are smaller and attach again.